The three biggest US sports leagues have just six people of color as principal owners. Team ownership is still largely the territory of white men. It's a trend that doesn't look like it'll change anytime soon. "Historically the wealth in this country belongs to white males," said sports attorney Richard Roth. 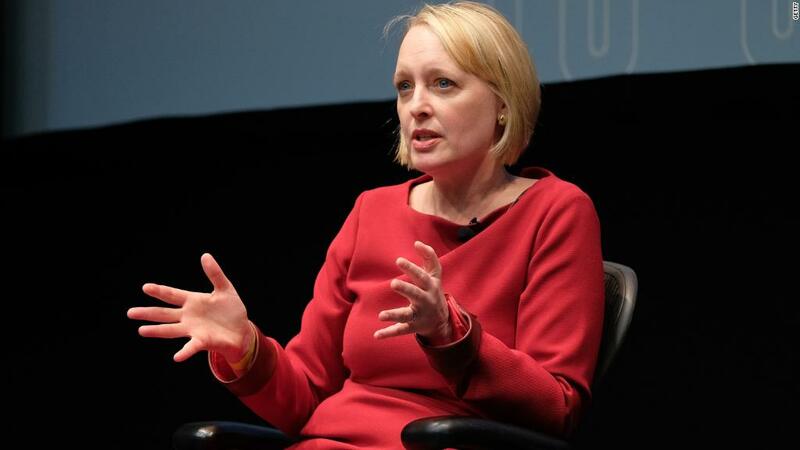 "It's the same reason most Fortune 500 companies, most law firms, etc. are owned by white males." Owning a pro sports team can be very lucrative but they're also obscenely expensive to buy, fetching billions of dollars. That's something even most wealthy people can't afford single-handedly, according to Roth. "I do believe you'll see more [people of color] break that glass ceiling," he said. "It just takes a little longer because of the size of the money." The Buffalo Bills and Jacksonville Jaguars are the only NFL teams with owners who are people of color. The other obstacle to more diversity among owners is how infrequently teams go on the market. There are only 92 teams total in the NFL, NBA and Major League Baseball and people tend to hold on to them. Roth, who has represented Peyton Manning and Warren Sapp, noted that 22 of the teams in the NFL have been owned by the same person or family for at least 20 years. Last year, when the owner of the Carolina Panthers said he'd be putting the team up for sale, an opportunity to increase the diversity of the NFL's ownership group arose. Sean Combs, otherwise known as Diddy, tweeted his interest in purchasing the franchise. Combs, a successful rapper and music mogul worth an estimated $820 million by Forbes, said he wanted to become the NFL's first black principal owner. New England Patriots owner Robert Kraft commended Diddy for being a "good businessman" and said he respected the mogul. Neither Combs nor the Panthers commented on whether Combs made an official bid. But on Tuesday the team sold to hedge fund billionaire David Tepper, who is white. 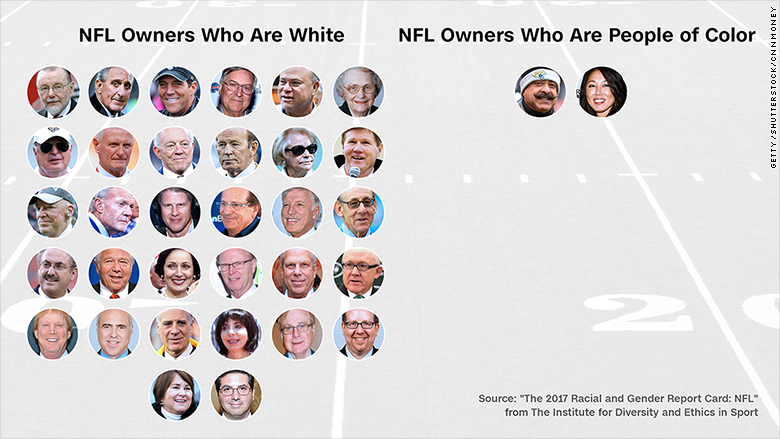 That means there are still just two people of color among the principal owners of the NFL's 32 teams. 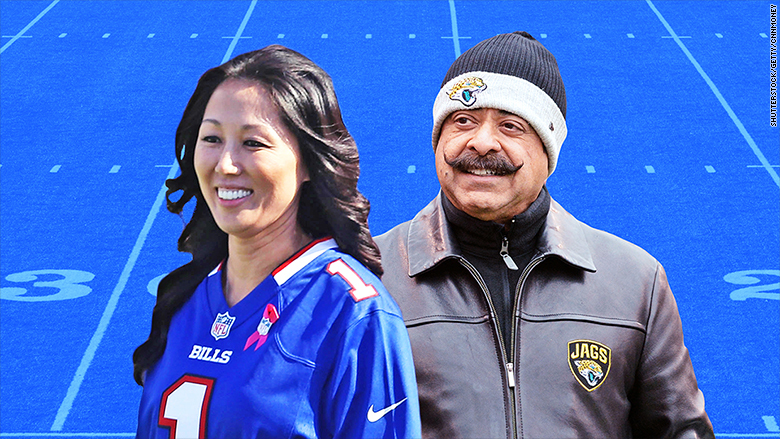 They are Jacksonville Jaguars owner Shahid Khan, who is Pakistani American, and Kim Pegula, who is Asian American and co-owns the Buffalo Bills. Kim Pegula, co-owner of the Buffalo Bills, and Shahid Khan, owner of the Jacksonville Jaguars. The NBA's 30 teams have a bit more ownership diversity. Sacramento Kings owner Vivek Ranadivé is Indian American, Milwaukee Bucks co-owner Marc Lasry is Moroccan-American and Michael Jordan, who owns the Charlotte Hornets, is African American. Major League Baseball, which also has 30 teams, is the least diverse. Arte Moreno, who is Mexican American, is the only person of color to be the majority owner of a team. Celebrities like Will Smith and Kevin Hart as well as former athletes like Derek Jeter, Grant Hill and Magic Johnson are partial owners of teams in the NBA and Major League Baseball. But while they're all people of color, they don't have majority ownership. The Panthers deal with Tepper is pending NFL approval, but is likely to be approved given that he's already a member of the club as a minority owner of the Pittsburgh Steelers. Being a partial owner may have helped Tepper's bid, according to Dr. Richard Lapchick, director of the Institute for Diversity and Ethics in Sports. The institute tracks racial and gender diversity in sports. "Who owners invite into their fraternity -- and it is overwhelmingly a fraternity -- is self-selective," he said. Lapchick said that while rules exist to ensure diverse candidates are considered for team positions, the leagues and commissioners can't force owners to accept or even consider people of color when teams are put up for sale. According to the institute's latest reports on the three leagues, the lack of diversity also extends to coaches and mangers. While the NFL enacted the Rooney Rule to bolster the number of minorities in coaching and football operation jobs, there's been criticism about its effectiveness and it doesn't extend to owners. The lack of diversity among ownership, management and coaching staff becomes even more stark when you consider the makeup of the players in the league. According to the institute's latest report on the NBA, nearly 81% of players are people of color. In the NFL, players of color make up almost 73% of the league. The report on Major League Baseball found roughly 43% of the league's players are minorities. Lapchick noted that players have become more vocal and activist-minded, which he said could be invaluable. He said players can use their positions as leverage to advocate for more diversity at all levels of a team.